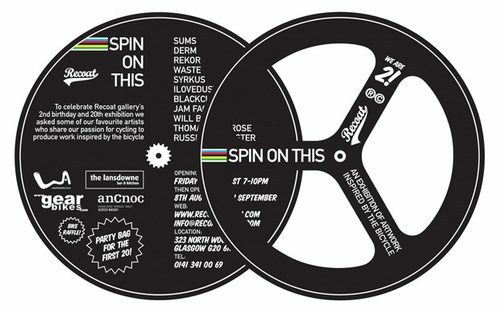 Celebrating their 2nd anniversary as well as their 20th exhibition, Glasgow’s Recoat will host their “Spin on This” exhibition later next month. The bike-centric exhibition brings together a number of their friends and close associates to create various bike-themed pieces which include old Tour de France portraits, DIY bikes, bike storage solutions and photography among other mediums. The artists participating include Will Barras, ilovedust, SUMS, DERM, WASTE, Blackcloud, Jam Factory, REKOR, SYRKUS, Pone, Thomas Deeprose and Russell Dempster. The exhibition begins on August 7th, 2009 and runs until September 6th, 2009 with special grab-bags from sponsors given out on the August 7th opening night.